We all know Steve Jobs (Steven Poul Jobs) as the creator and CEO of Apple. The evolution of Apple and the success of its products will be his legacy in the long run, but it is interesting to learn about how he ascended to where he ended up being. Steve Jobs was born in San Francisco on February 24, 1955, and is of Syrian and German descent. His biological parents – Abdulfattah Jandali (father) and Joanne Carole Schieble (mother) were still students and couldn’t afford to raise the child. Jobs was adopted soon after his birth and grew up predominately in Mountain View, California. He was introduced electronics at very young age by his father Paul Reinhold Jobs who worked for a company that made lasers called Spectra-Physics, and his mother who was an accountant for one of the first high-tech firms. As a matter of fact, Clara, Steve’s mother, had a job in The Silicon Valley long before he did. His father had never graduated from high school, but he was a smart man and was passionate about making and repairing different things. He was a great mechanic and this helped him to earn some additional income for the family. He had a workshop in the garage, where the young Steve Jobs loved spending time with him. Steve loved helping his father. He admired his passion and was astonished by the attention he paid to every single detail of the things he made. Jobs attended public middle school and high school in Cupertino, California and there he met one of the influences that would not only shape his high school years but many years to come. It is there that he met Apple co-founder Steve Wozniak and the two clicked right away. He was not really a sociable student, and he didn’t make many friends there. One of the reasons for that was that the young Steve had completely different interests than his mates. He was just a lot smarter than most of them and instead of doing some ordinary boys’ things, he preferred to dedicate his time to what he adored – technology. During that time he got his first job, which was screwing some nuts and bolts on an assembly line in Hewlett Packard factory. He worked only during the summer when he was free of school and he loved that job because electronics was his biggest passion. After graduating from high school, Jobs attended Reed College in Portland which was a very expensive private school. After six months at the college, Jobs would drop out. Not only he found no value in this kind of education, but he was spending his parents’ lifetime savings for something that had no potential at all. So, he quit officially, but actually stayed there for the last year and a half, attending only classes he enjoyed. The times were hard for him, he slept on the floor of his friends’ dorm rooms and didn’t even have money for food. To be able to eat, he returned empty bottles getting 5 cents for each. But later in his life, he would share that was some of the best time in his life. Steve Jobs’ first full time and a serious job was in the technology space at a company called Atari. For those of you, who are little older, you will know that Atari was a video game system and one of the pioneers in the industry. Stumped by a particular circuit board project that the bosses at Atari wanted him to complete, Jobs enlisted the help of his old friend Wozniak, to help him through this conundrum. The pay for the work was $5 000 dollars, but Steve lied to Wozniak that he got only $700 and after a 50/50 split Woz ended up with only $350. As the early 70s became the mid 70s Jobs and Wozniak began to partner on different computer-related ideas. Within their tinkering, in 1976 Jobs and Wozniak decided to start a business on their own. That business was Apple Computers which first started selling circuit boards but then graduated to making computers. Jobs would later explain that he choose the name just because he liked apples and also because the name “Apple” appeared before “Atari” in the phone book. We all know Apple Computers today, but the vision Jobs and Wozniak had all the way back in 1976 was truly amazing. They had to raise $1350 of capital to start their company. They didn’t have the cash, so Wozniak had to sell his HP calculator and Jobs sold his old car. This is how they acquired the money, which they both initially thought that they would never see again. Their first office initially was a spare bedroom and after that, they moved into the garage of Jobs’ house. Jobs would be at Apple until 1985 at which time the company was public and the CEO John Sculley would eventually make a determination that Jobs was bad for the Apple brand and the wrong person to lead the company. He organized a boardroom coup in order to remove Jobs from his position a decision that looking back on it was ill-advised. The very founder of the company was about to be fired from his own business, what a crazy world?!? Nonetheless, Jobs ended up resigning from Apple and selling all of his shares thereafter he was removed from his managerial duties and started his own computer company in 1985 called Next Computer. Next computer was somewhat of a success as you will see in a minute. Just 3 years later, in 1988, the new company introduced their first computer, which has implemented some really nice innovations like an optical disk drive, high-quality graphics, and a really fast processor. But the machine had a big disadvantage – its price. The latter was set at 9950 US dollars, which was very expensive for most of the potential buyers. That’s why the business struggled to make enough sales to stay afloat. And this was one of the main reasons for Jobs to start paying more attention to a company called Pixar, which he bought back in 1986 from the famous producer – George Lucas. This acquisition of the Graphics Group (the previous name of Pixar) by Steve Jobs ended up being one of the best business deals he ever made. Pixar went on in 1995 to create its first movie, Toy Story, on which Jobs was an executive producer. It was also the fir ever film, made by computer animation. Since then Pixar has had hit after hit movie and a lot of that can be attributed to the vision of Jobs all the way back in 1986. Disney bought Pixar for a reported $7.4 billion in 2006 and when the acquisition was completed Jobs became the single largest shareholder in the Walt Disney Company. Now back to the computers. Next Computers was such a success that it was actually bought out by Apple ironically for $427 million in 1996. They needed Steve Jobs back because the company’s business wasn’t going really well. The stock prices of Apple’s shares had plummeted and this was an act of getting the old captain back on board. This brought Steve Jobs back into the board of directors of the company he co-founded more than 10 years ago. The very next year, in 1997, Apple announced a big loss of more than $700 million. This caused the CEO Gilbert Amelio to resign. 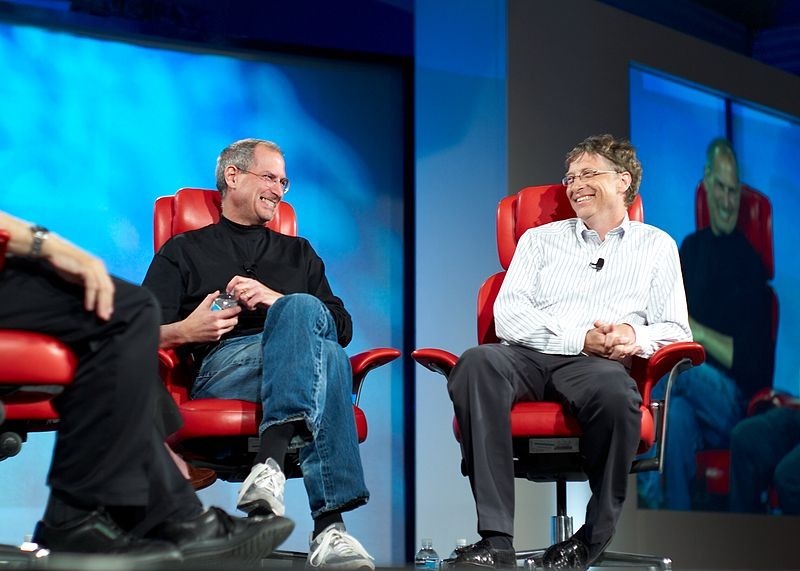 This is how Jobs became a CEO for a second and the last time. Since then he has revolutionized the technology industry. He not only had visions for improving the Macintosh computer which is an Apple staple but also was a true game changer in the world of digital music and the mobile phone industry as well. Today people have iPod, iPhone, or iPad because of the vision of Steve Jobs. He is a true trendsetter and brought his innovative ideas to different industries and thus making the world a more productive place in the process. After becoming Apple’s CEO again, in 2000, Jobs would resign in August of 2011 after it was clear that health problems had gotten the best of him. Jobs was diagnosed with pancreatic cancer in 2004 and would eventually succumb to it October 5, 2011. We remember Jobs though the way he changed the world and the impact he had on the lives of many. He is a true pioneer of the technology industry and learning a little bit about how he got there can be eye-opening to those looking for motivation. Hopefully, this piece gave you little more insight into the before and after Apple days of Steve Jobs and gives you the motivation to strive for your own goals. Don’t miss watching the movie – Pirates of Silicon Valley, which is about the early story of Apple, Microsoft, and their founders. It’s one of the greatest business films I have ever watched and I strongly recommend it. It will be cool if you share this post with friends if you liked it. This way you will support our work, too. Thanks!